"On Father's Day we all tried this delicious dessert, which everyone loved. 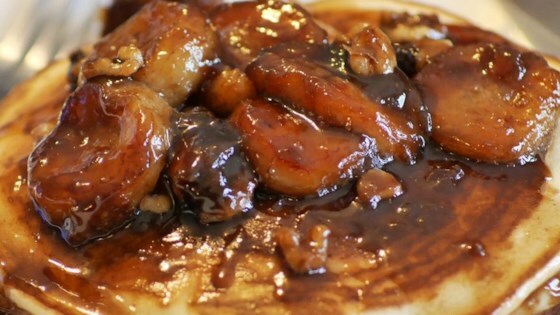 Bananas warmed in buttery rum sauce over vanilla ice cream." In a large, deep skillet over medium heat, melt butter. Stir in sugar, rum, vanilla and cinnamon. When mixture begins to bubble, place bananas and walnuts in pan. Cook until bananas are hot, 1 to 2 minutes. Serve at once over vanilla ice cream. Awesome!! !....and so simple. Be sure to only "warm" the bananas in the sauce, otherwise bananas wil be too mushy.